How Often Should You Really Clean Your Kitchen Cabinets? 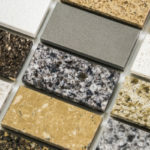 Kitchen Cabinets and Granite Countertops, Pompano Beach FL > Blog > Blog > How Often Should You Really Clean Your Kitchen Cabinets? 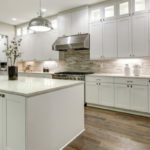 In general, you should use a soft cloth to wipe down kitchen cabinets a few times a week, but the amount of deep cleaning your cabinets require has a lot to do with how often you use your kitchen. By keeping up with overall cleanliness your cabinets will last longer and look nicer for many years to come. This is especially true regarding cabinets that are near your stovetop, where oils routinely float up while you cook and coat cabinet faces with an icky build up. As a rule of thumb, quickly wipe down all cabinet faces at the end of the day if you cooked in the kitchen. If you cook almost every day, it’s important that cabinets are regularly wiped clean to prevent stubborn build up. If you rarely use your kitchen, you can get away with wiping down cabinet surfaces closer to once every one to two weeks. What should I use to clean my cabinets? For daily or weekly maintenance, use a soft cloth dampened with warm water. If there’s a smudge or stain, add a little dish soap or non-abrasive cleaner to the rag to help remove it. When deep cleaning and removing build up, you may want to use orange oil based cleaner along with a plastic dish scrubber. Also, there are a number of wood-based cleaning products on the market that are safe to use on most cabinets. Always start by trying out the cleaner on a discreet portion of your cabinet to ensure it doesn’t cause any discoloration before applying all over. Cabinet Build Up: What’s that sticky stuff on my cabinets? Without proper cleaning, you’ll start to notice a thick substance building up on your cabinets. This is a combination of grease from cooking and dust that settles on top. When this combination of dust and grease heats up, it becomes a sticky coating. Simply wiping your cabinets down with a moist rag at the end of each day will prevent this from occurring. Without regular cleaning, this coating can become thick, hard and difficult to remove. A well ventilated range hood will help reduce the amount of build up that occurs, but that doesn’t mean you’ll never have to wipe your cabinets clean again. How do I remove sticky build up on cabinets? Apply orange oil cleaner to cabinets and let sit for 2-4 minutes. Mix together 3 parts baking soda and 1 part water to create a non-toxic paste. Dip a soft bristled brush inside of the mixture and then gently scrub over surfaces. You may need to repeat this process several times. Make sure that all oil cleaner and baking soda paste is thoroughly removed and cabinets are completely dry before considering it a job well done. Try not to scrape at your cabinets to remove build-ups, as this increases the likelihood you will scratch or damage cabinets. How often should I clean the insides of my cabinets? The insides of your cabinets require regular cleaning as well, just not as often as the exterior cabinet faces. 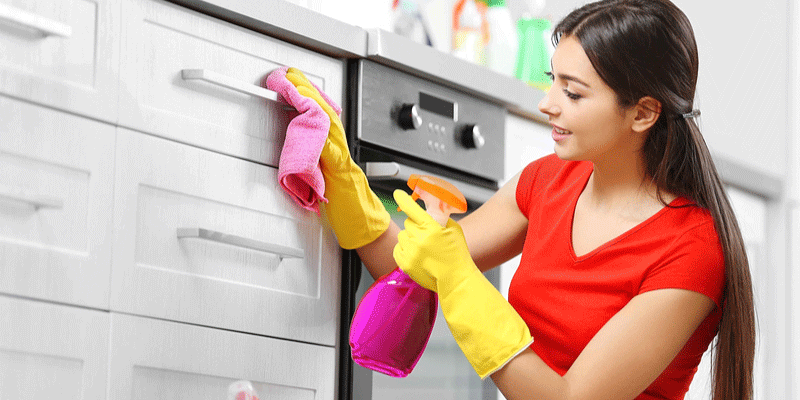 Aim to clean interior kitchen cabinet surfaces about once every few months. You’ll notice that even within this short amount of time, a lot of dirt, debris and crumbs build up. Cabinets littered in crumbs invite bugs and other pests to come inside and enjoy a feast. In order to properly clean, you’ll need to remove all of the food items inside of your cabinets. This is the perfect opportunity to toss out old and expired food items. Cleaning out dish cabinets is equally important as cleaning out food cabinets. Plus, it gives you a chance to donate dishes or other utensils that no longer serve you. What should I use to clean the insides of my cabinets? Use a damp cloth to wipe down the insides of cabinets, make sure surfaces are completely dry before putting anything back inside and closing the door. Leave empty cabinets open for 1-2 hours before replacing items. For a deeper clean, use orange oil cleaner or a dot of mild dish soap. 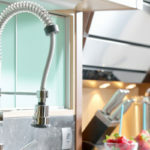 You may find a handheld vacuum or a vacuum with a hose nozzle useful to clean up larger crumb spills tucked away in the corners of your cabinets. Most vacuums are coated in germs, so be sure to disinfect and wipe down interior cabinets after using a vacuum to prevent contamination. Don’t forget to clean the hardware on your cabinets too! 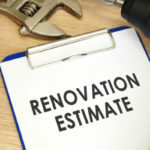 This process will vary depending on the materials your hardware is made out of. For silver and cooper hardware, mix together equal parts vinegar and water. Remove hardware and soak in the solution until you see dirt and grime is easy to rub away. Use a sponge or rag to scrub hardware until it looks clean. You can add some dish soap to the mix to help remove stubborn gunk. Rinse with clean water and pat dry, let sit out until completely dry. Once dry, reapply hardware to cabinets.